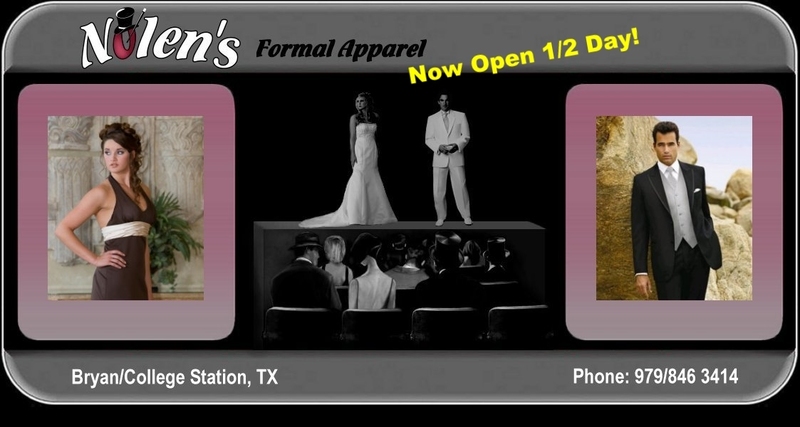 Nolen's is yor wedding dress source in Brazos Valley, TX. We can help you find the right bridal gown, wedding dress, prom dress, quinceanera dress, flower girl dress for your next event. We also help people located in the rest of the Brazos Valley like Caldwell, Hearne and Navasota, TX. Our helpful staff can assist a future bride choose from some of the top wedding gown manufactures like: Venus, Forever Yours, Eden, Jasmine, Alexia, J-L-M, Jim Hjelm, Rosalie, Bill Levkoff and more. So, if you are you a future bride, looking for a bridal store that is locally owned and operated and not a large discount store like David's Bridal, than Nolen's is the place to shop for your wedding needs. We can help you choose your bridesmaid and flower girl dresses. We can also help with mother of the bride. When choosing for mother of the bride, bridesmaid and flower girl, we offer dresses from the same fine manufactures like Venus, Forever Yours, Eden, Alexia, Jasmine and Jim Hjelm. We are here to help you choose your next bridal gown, wedding dress, prom dress, quinceanera dress, flower girl dress. For the man we offer tuxedo rental. And, don't forget that we carry special occasion dresses for a homecoming, Quinceanera or prom from manufactures like Cassandra Stone, Mac Duggal, and Do You Love Me. We also handle a full line of formal wear accessories. If you live in Central Texas or in Brazos County, TX and are looking for the wedding gown of your dreams, choose Nolen's! This page originated from b3apechio.